Whisk these 2 till pale and fluffy and the sugar dissolves. Add milk and oil into A and whisk. Sift in the dry ingredients and mix till even. Beat till egg whites are foamy, and add in the cream of tartar and castor sugar 1 tablespoon at a time in intervals. Beat till stiff peaks form. Put mixer on low speed and pour in the mixed Ingredients A & B. Mixed till even. Pour into chiffon pan & bake for about 50 mins. Check for doneness using a skewer. Melt chocolate chips over a Bain Marie till chocolate has melted. Add in the cream and butter. 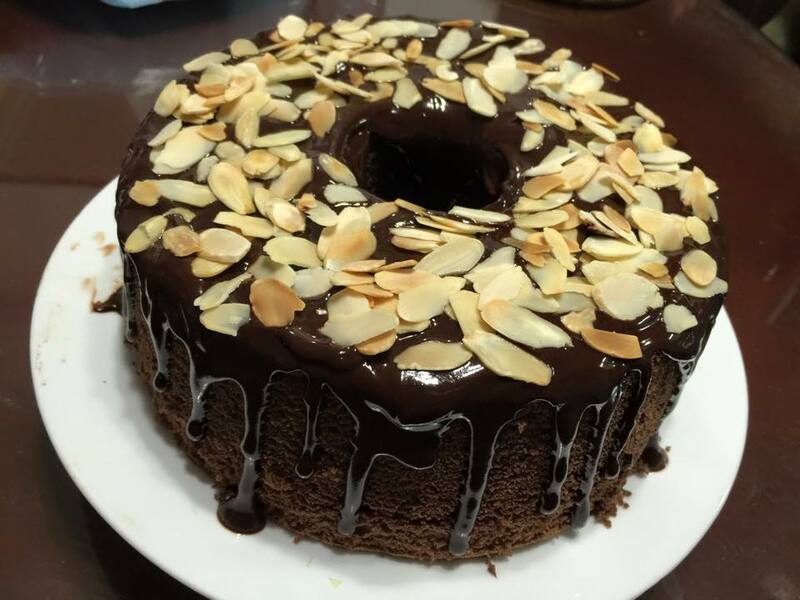 Once everything has melted, drizzle over the chocolate chiffon cake. Decorate with toasted almond flakes.